The two networks strategy is a guiding model for planning and design that takes the networks of water and traffic as carrying structures. Its origin is in the early 1990s when it resulted from research by design projects aiming at the generation of tools for making urban development and the urban landscape more ecological. Reviewing practical experiences is one reason to look again at the strategy. A second reason is to explore the possible contribution to current debates such as those about complexity, landscape urbanism and landscape as infrastructure. The origin of the two networks strategy goes back to Ian McHarg’s Design with Nature and Michael Hough’s City Form and Natural Process. Inspired by them, the approach does not, in the first place, take nature and ecology to create limiting but carrying conditions. This asks for carrying structures. In the urban landscape there are at least three crucial fields of synergy between activities that ask for carrying structures: the territorial or spatial field or the area perspective, the activities related to flows that pass through these areas or the flow perspective, and the human activities involved in the plan and in the planning process or the actor perspective. The two networks create conditions for two multi-functional environments of synergy. The fast lane is the competitive profit-oriented zone where efficient production comes first. The traffic network is the carrier. The slow lane is the co-operation based non-profit oriented zone where water safety and quality, landscape and heritage, biodiversity, recreation and local food production are brought together. Here, the water network based on the drainage pattern is the carrier. Faludi, A. 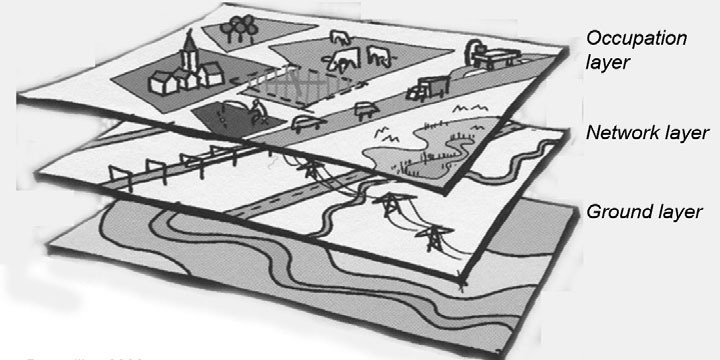 (1987) A decision-centred view of environmental planning. Oxford, Pergamon Press. TJALLINGII, Sybrand. Planning with water and traffic networks. Carrying structures of the urban landscape. Research in Urbanism Series, [S.l. ], v. 3, p. 57-80, apr. 2015. ISSN 1879-8217. Available at: <https://journals.open.tudelft.nl/index.php/rius/article/view/832>. Date accessed: 23 apr. 2019. doi: https://doi.org/10.7480/rius.3.832. Author(s) hold their copyright without restrictions.